Part 2 of the “Pre-Packed Kits” Series! The OEM aluminum kit is highly recommended for shops that mainly handle ford vehicles. This kit is identical to the one Ford requires for aluminum certification. Although it is currently only required by Ford, this kit could bring any shop closer to their aluminum certification in other OEM programs. 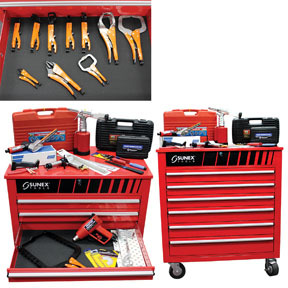 This kit has a wide range of hand and powers tool all packed in their own tool cart to avoid cross contamination. Remember, last week we brought you the Basic Aluminum Kit. Be sure to check it out and see which kit works best for you! We will finish up next week with the Deluxe Aluminum Kit. So stay tuned! This entry was posted in Auto Performance, Automotive Technology, Car Maintenance, Do It Your Self Mechanics Post, General, Learning Center, Mechanics Blog & Mechanics Tools by MACK HANSON. Bookmark the permalink.